Steve Birnage and I were fortunate enough to talk at the HBAA (The Hotel Booking Agents Association) 13th Annual Forum this week on their theme of Future Vision. 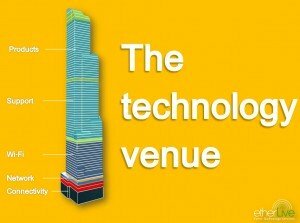 We based our workshop on the concept of a ‘technology venue’ using each of the various ‘floors’ to represent a technology and how, for example, any service offering (near the top of the building) needs a good foundation at the bottom. The foundation – High speed, dedicated uncontended internet access is a must. Many venues still attempt to share one connection between rooms, bars and conferencing facilities but this won’t meet many conference organiser requirements these days. We have recently upgraded a London customer with significant bandwidth for their conferencing facilities entirely separate from them having great connectivity for their bedrooms. Ground floor – A good, reliable wired network which is managed by a third party or venue with appropriate support can make deploying services and performing upgrades later on quite straightforward. Here we were using examples about running fibre between key points in the building (either at design or re-fit) to ensure high speed services can be delivered without causing massive headaches. We used the term ‘managed’ a lot within this section but really the key is to ensure services can be changed quickly remotely. First floor – Reliable Wi-Fi networking. Separate to the internet or network on site it is critical to ensure a wireless network is deployed to deal with the appropriate requirements in mind. For example a conference room which seats 500 needs to have the wireless infrastructure to handle that. New technologies can really help here – like 802.11n mesh wireless networks which can be extended by just plugging in access points which automatically extend coverage however this is dangerous to do unless your environment will automatically minimise interference or you have an appreciation of what channels other access points are using. Second floor – Make sure you have the support lined up since there is nothing worse than investing and not realising value. Not only should venues have technical support, be it in house or outsourced but also staff should be familiar with the functions and features so they can represent it to customers and prospects who may ask. Third floor – The critical revenue generation floor – here venues should be thinking past charging for the internet access and looking at sponsored hijack pages, content driven micro sites, support for live streaming and perhaps a strategy about how to re-use customer content in terms of video (perhaps for those who could not attend). Those key areas got some great interaction from the audience. Many of whom have made significant investment in technology but continue to look for opportunities to maximise return. It was also great to have discussions with several of the larger hotel brands who are committed to contracts and are keen to ensure contracts continue to keep a focus on innovation.